Fans of both Army Wives and Drop Dead Diva have been a bit nervous lately since both finished airing their respective seasons in August. Are they coming back or not? If you were among them, you can now rest easy. The cable channel has just announced that they’re renewing both for 13 episodes apiece. Drop Dead Diva’s two previous seasons have had 13 installments each. Army Wives meanwhile has had two seasons of 13 and two seasons of 18 episodes. LOS ANGELES, CA (September 23, 2010) – Lifetime Television has renewed its hit scripted series Army Wives and Drop Dead Diva for their fifth and third seasons, respectively, to premiere in 2011, during which 13 all-new episodes of each program will air on the network. The announcement was made today by Nancy Dubuc, President and General Manager of Lifetime Networks and HISTORY. Army Wives follows the struggles, dreams and friendships of a diverse group of women – and one man – living with their spouses and families on an active army post. The series stars Kim Delaney, Sally Pressman, Brigid Brannagh, Brian McNamara, Sterling K. Brown, Wendy Davis, Drew Fuller, Terry Serpico, Katelyn Pippy and Catherine Bell. The most successful series in Lifetime’s 26-year history, Army Wives’ fourth season averaged 3.2 million total viewers this year. Its season four finale on August 22 was the program’s most watched episode of the year across all demographics, including Total Viewers, Adults 25-54, Women 18-49, Women 25-54, Women 18+ and Adults 18-49. Army Wives is produced by ABC Studios for Lifetime Television. Mark Gordon and The Mark Gordon Company’s President of Production, Deborah Spera, serve as executive producers. Jeff Melvoin, Marshall Persinger and Harry Bring also served as executive producers of season four. The series is based on the book Army Wives: The Unwritten Code of Military Marriage by Tanya Biank, who serves as a consultant. ABC Studios develops and produces compelling programming for broadcast on ABC, as well as across television and digital platforms. The successful partnership between ABC Studios and ABC Entertainment has delivered some of the most successful, talked-about and evolutionary series on television today, including Desperate Housewives, Grey’s Anatomy and Brothers & Sisters. Drop Dead Diva tells the story of a shallow, aspiring model who dies in a sudden accident, only to find her soul resurfacing in the body of a brilliant, thoughtful and plus-size attorney (Elliott). 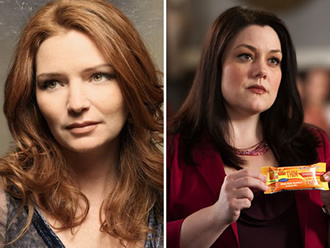 Drop Dead Diva also stars Margaret Cho, Jackson Hurst, Kate Levering, April Bowlby, Josh Stamberg and Ben Feldman. Guest stars throughout the second season of Drop Dead Diva included Paula Abdul, Cybill Shepherd, Rosie O’Donnell, Jake Pavelka, Chad Lowe, Vivica A. Fox, Sharon Lawrence, Ricki Lake, Nancy Grace, Leelee Sobieski and Natasha Henstridge, among others. The second season of the series was seen by over 49.9 million Total Viewers. Josh Berman is creator and executive producer of Drop Dead Diva, which is produced by Sony Pictures Television for Lifetime. Craig Zadan and Neil Meron of Storyline Entertainment and Alex Taub are executive producers. Sony Pictures Television is one of the television industry’s leading content providers. It produces and distributes programming in every genre, including series, telefilms, theatrical releases and family entertainment around the world and for every platform: broadcast and cable television, first-run and off-network syndication and digital distribution. In addition to one of the industry’s largest libraries of feature films and television shows, SPT boasts a current program slate that includes the top-rated daytime dramas and game shows, landmark off-network series, original animated series and critically acclaimed primetime dramas, comedies and telefilms. Internationally, SPT is a leader in local language productions around the world, some of which are co-produced with local partners and sells SPE-owned formats in approximately 70 countries. To better serve its clients and partners worldwide, SPT maintains offices throughout the world, including Argentina, Australia, Brazil, Canada, France, Germany, Hong Kong, Hungary, India, Italy, Japan, Korea, Mexico, the Netherlands, the People’s Republic of China, Russia, Singapore, Spain, Venezuela and the United Kingdom. SPT’s worldwide television networks portfolio is a key strategy in SPE’s long-range commitment to the global marketplace, with 114 channel feeds, which are available in more than 130 countries reaching almost 400 million households worldwide. SPT also creates original content for and manages SPE’s premium video website, Crackle. Additionally, SPT is a part owner of cable channel GSN, FEARnet, the premier horror/thriller website and VOD service, and national media sales company ITN Networks, Inc. SPT advertiser sales is one of the premiere national advertising sales companies, handling the commercial inventory in SPT’s syndicated series as well as in all of SPE’s digital businesses in the United States, for Sony Music Entertainment and for the Tennis Channel. SPT (www.sonypicturestelevision.com) is a Sony Pictures Entertainment company. Lifetime Television, the number one rated women’s network, is committed to offering the highest quality entertainment and information programming, and advocating a wide range of issues affecting women and their families. Lifetime Television, Lifetime Movie Network, Lifetime Real Women and Lifetime Digital (which includes myLifetime.com, LMN.tv, Lifetime Games, Roiworld.com, DressUpChallenge.com, MothersClick.com and LifetimeMoms.com) are part of Lifetime Entertainment Services, LLC, a subsidiary of A&E Television Networks, LLC. A&E Television Networks is a joint venture of the Disney-ABC Television Group, Hearst Corporation and NBC Universal. What do you think? Are you glad to hear these shows are coming back? Do you enjoy one more than the other? More about: Army Wives, Army Wives: canceled or renewed?, Drop Dead Diva, Drop Dead Diva: canceled or renewed? I love both of these shows. I’m curious as to how Army Wives will be if they all go there separate ways. I love it being based on an Army base. Can’t wait for Drop Dead Diva to start but hating seeing Army Wives go and also Desperate Housewives. I love Sunday night night TV thanks to these (3) wonderful shows. Oh! I can’t leave out Brothers & Sisters – that’s also great!!! I am eagerly awaiting the return of Drop Dead Diva, They should consider strongly putting it back behind army wifes it was a great combo. Hurrry and get it on the air.